Tired Of Waking Up And Not Being At The Beach? We Have A Cure For That! 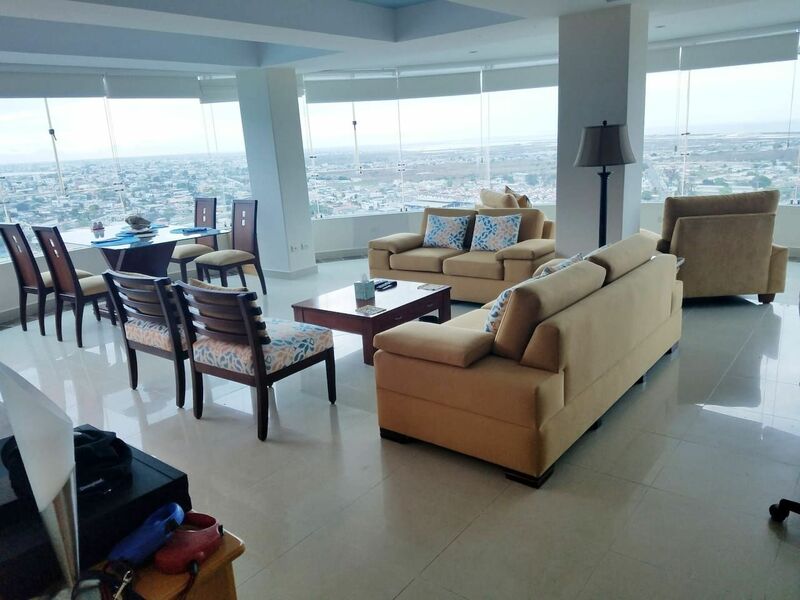 There’s no reason not to wake up and enjoy views of Salinas Bay and Mar Bravo while sipping your morning coffee, in this lovely two bedroom, two bath, high floor condo in the acclaimed Edificio Alamar. This building is secure and well-managed, and is right on the Malecon in Salinas. Walk out the front door to the beach or in either direction for restaurants or shopping. There is a mall a short drive or taxi ride away. Want to fish, water ski, or jet ski? It is all available on the Malecon beach! This is a quality, upscale condominium building. You won’t believe the amazing views afforded by the curved windows in this unit – easily 315-degree views from the open-concept living, dining, and kitchen areas. From the front, even though there are some buildings a few lots to the right, you can see the beach and ocean; from the rear you have unobstructed views of the Costa Brava; the airport, and La Libertad in the distance. You can watch the sun come up in the mornings, and the spectacular sunsets in the evening. At night, the lights of the peninsula create a sparkling carpet below. This luxurious 1,405 square foot unit is furnished to the high standards expected in North America, as most everything in the unit was brought in from the USA...Moen fixtures in the kitchen and baths, as well as, stylish imported lighting. The upgrades and recent improvements are almost too numerous to list... marble upgrades to desk and built-in furniture, new windows in the master bedroom, new rubber on the large curved windows, new furniture, as well as, water proofing the bodega/storage closet. This is truly turn-key ready, right down to the sheets and towels, etc.! A parking place in the covered parking garage, and a bodega/storage closet is included. This is an opportunity to own your own beachside condo, in a building boasting top-notch amenities: a swimming pool, separate kiddie pool, hot tub, sauna, steam room, gym, media room, and a game area with full-sized ping-pong table. When you wake up, you may think you are still dreaming, but this can be your reality! For a private viewing of this spectacular unit, please contact Kimberly at 098.621.2688 in Ecuador or 312.985.7703 internationally. You can also reach her at kimberly@ieiecuador.net.